College Fair: What’s Your Choice Going To Be? Have no idea what you are going to do with your life after high school? For those who answer yes to this or are not sure, the college fair at Paint Branch on October 11 in the gymnasium provided some help in figuring this out. The gymnasium was filled with students and representatives from over colleges. Throughout the day, students from all grades came to the gymnasium to examine some college options. Each school representative had a table that allowed students to obtain some information and ask questions to get information about the school. Period two was a seniors only period for visiting the fair. At this time, seniors gathered in the very hot and crowded gym. They hoped to find a school they did not know about or gain some information about a new place. 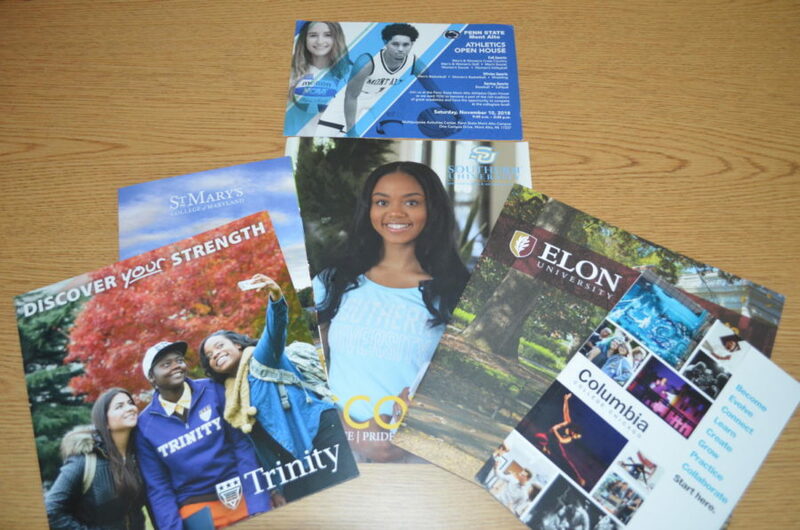 Some of the colleges on hand included Culinary Institute of Virginia, Columbia College Chicago, Montgomery College, Trinity Washington University, University of Maryland Baltimore County, Virginia State University, Rensselaer Polytechnic Institute (RPI), Penn State University, Albright College, York College of Pennsylvania, Spelman College, Fashion Institute of Design & Merchandising, The Restaurant School at Walnut Hill, Salisbury University, and Old Dominion University just to name a few. Another senior, Quenuma Gbormie, felt the presence of the college fair helped her alleviate some of the pressure she is feeling about picking a college. She also felt that it would help her discover what she is looking forward to the most once she starts college -the new environment. “I’m feeling scared and overwhelmed right now, but I am looking forward to a good school environment and meeting new people,” Gbormie said. Overall, the college fair benefitted those who attended, especially seniors,and provided an opportunity for students to get a sense of what schools have to offer, where they are located, and what it takes to gain admission.